Under the Mistletoe, this Norman Rockwell painting, appeared on the cover of The Literary Digest published December 20, 1919. The alternate title for this work is Old Couple Under Mistletoe. This illustration was Rockwell's twelfth painting featured on the cover of The Literary Digest. The Digest featured Rockwell artwork on the cover nine times total in 1919 alone. on page 51 of Norman Rockwell, A Definitive Catalogue by Laurie Norton Moffatt. With this painting, Norman Rockwell initiates his tradition of having a Christmas cover on the cover of The Literary Digest in December. Under the Mistletoe was only one of 47 Norman Rockwell Literary Digest covers; here is the list of more Norman Rockwell Literary Digest scans. 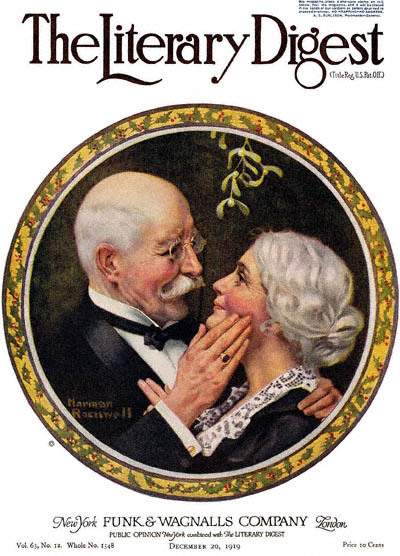 Under the Mistletoe portrays an old couple in the middle of a embrace, looking lovingly into one another's eyes. They are about to enjoy a kiss. The man wears his tuxedo and bow tie. He is wearing his best cuff links. He is carressing the face of his wife with his right hand. The lady is wearing a fine black dress with white lace collar. Her left hand is resting on his lapel. Judging by their dress, they are attending a Christmas party. The mistletoe overhead is allowing them to kiss in public. The painted frame around the main part of the picture features holly leaves and berries, another plant used in traditional Christmas decorations.